Blazingly fast technological progress is all around us these days. Improvements occur almost weekly in many aspects of our day to day lives. Some of these advances are genuine game changers, others fail miserably to live up to the hype. Legit innovation in the adventure sports sector definitely takes place at a slower pace than it does in other spheres. The reasons for this are varied and worthy of a separate article, so we won't get into that here. One aspect I would like to highlight, is that real technological advances require significant investments of time and money. Back in May of 2018 you may have read an article in Surfbunker, bringing your attention to a Kickstarter campaign for a company called Cab9 Eyewear(article here). These cool gents up in the French Alps, had put in the hard graft and the dollar required to come up with a genuine advance in eyewear lens tech. They did, however, need a bit of extra funding, to help get production started and bring the product to market. Thanks to anyone who decided to contribute, because the crowdfunding was a great success. Late in 2018, us lucky chappies here at Surfbunker opened up a small package and were delighted to find inside the fruit of all this time and effort: Cab9’s THE EDGE model. Luxury items always result in a bit of a scramble here at SB HQ. Luckily, having already reviewed(check that out here) Cab9’s CX9 model, common sense won the day and I was ordered to sink my teeth into their latest offering. The Cab 9 Edge in the flesh and on my patio. I dig sunglasses, never leave home without them. Without shame, I’m that plonker who still has his sunnies on when it starts to get dark. I’ve always been this way and my friends will tell you it's just one of my little quirks. Goes without saying that I consider myself a bit of an aficionado when it comes to eyewear. The Edge model certainly didn’t disappoint. I loved these glasses from the minute I opened the box. We received the “Fire Red” model and aside from the striking lens tint, the first thing that really stood out was the weight, or lack thereof. These beauties tip the scales at an almost unbelievable 25 grams. No, that’s not a typo, 25 grams. That’s about the same as a spoonful of baked beans. Needless to say, once you put these on, you forget they are there. 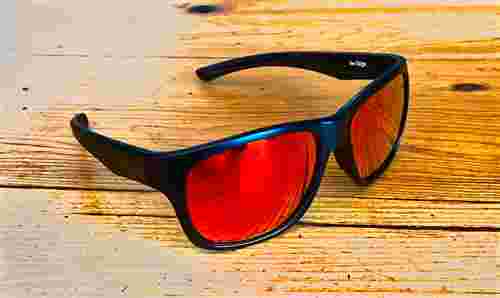 If you have had a gander at the review we published on the CX9 model, you’ll already know that all Cad9 eyewear come with polarized lenses. These significantly reduce glare and eyestrain in bright and/or reflective conditions. As you would expect with quality eyewear, they also provide 100% UVA/B/400 protection. The frames are made from state of the art TR90 Polycarbonate which makes them lightweight, flexible and highly resistant to impact. Though I may be a lover of shades, unfortunately I don’t generally show them a great deal of love. That is to say, I'm pretty hard on my sunglasses. I've been rocking my pair of “The Edge” for nearly 3 months now. To their great credit, and in line with the manufacturers claims, they have proven to be incredibly hard-wearing, durable, and resistant to scratches and marks. They are also insanely comfortable to wear. The Infrashield is not a gimmick. The difference was pretty apparent. Normally I take blurb such as this with a pinch of salt. We’ve all looked at the tags on a new wetsuit or pair of boardie's only to be overwhelmed with techno jargon and promises of life changing performance. Cab9 however, really have delivered. These really are fantastic sunglasses. In the 3 months I’ve owned them, in all honesty they are now my go to shades. I’ve worn them on the beach in Portugal, in the mountains near Granada and driven for hours into the setting Cornish sun. The chioce in lens colours for The Edge. They really do reduce eye strain. No false claims here! From a technical, practical and aesthetic point of view, these really are a premium product. As with all the eyewear in the Cab9 range, the thing that really jumps out at you is the price. “The Edge” model is currently priced at an insanely low €55. For me this is crazily good value. When you take into account the build quality, level of innovation, materials and features. This is a pair of shades other manufacturers would be pricing at 3x this level. I really cannot find fault with this product on any level. So, if you are in the market for a new pair of shades, hop on over to the Cab9 website and grab yourself an absolute bargain.